Now that there's only about a month left until fans see Colton Underwood pick his final rose winner, The Bachelor is getting down to the wire. Eliminations are happening left, right and even outside of rose ceremonies! Monday night's episode really stirred up the drama — especially since Colton is having a hard time figuring out who he can trust. Remember the drama between Onyeka and Nicole from last week? Yep, we finally got the conclusion. After Colton took a walk on the beach to cool down, he returned to the rose ceremony and meant business. He decided to eliminate both of them. Onyeka laughed it off while Nicole was more hurt about being sent home. At least now Colton can focus less on the drama and more on figuring out which of these women he wants to spend the rest of his life with. The first one-on-one date went to Hannah G., and they enjoyed a spa day together, complete with a lot of making out, a mud bath, and a steamy shower. Caelynn was obviously feeling a little intimidated by the whole thing, because back at the house, she couldn't stop talking about how Hannah G. probably just has "relied on her beauty for so much of her life” and doesn't think she has “depth.” Ouch. Over dinner, Hannah proved that she's not just good looks when she opened up about her parents' divorce and connected with Colton who is also a child of divorce. She leaves the date with a rose. Demi, Cassie, Heather, Tayshia, Caelynn, Katie, Hannah B., and Sydney head out to partake in Vovinam, which is a Vietnamese martial art. Instead, the women are more concerned about having enough one-on-one time with Colton and he spends the rest of the date consoling them. 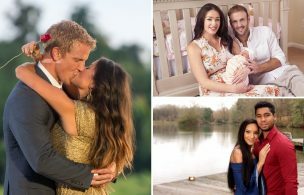 Will it be someone from Colton's 'Bachelor' season? Or maybe they'll choose someone from the past! Tayshia gets the date rose. After talking with Colton multiple times about how uncomfortable she was with the process of The Bachelor, Sydney still wasn't feeling right. She didn't feel like Colton could give her what she was looking for in a relationship, so she decided to gracefully bow out. But not before warning the single football player about women in house who aren't ready for commitment. “There are some very wonderful people in that group. Find them… Don’t be distracted by shiny things," she warns. The second one-on-one date went to Kirpa and her healed chin. She called the date “make-or-break” for their relationship as they've been developing along at a slower rate than some of the other ladies. Kirpa and Colton snorkel and kiss and at dinner she opens up about her previous engagement to — guess what?! — a virgin. She was with this guy for eight years but the relationship turned more into a friendship. Colton asked if at the end of this she'll be ready to get engaged again. She said yes and then got the date rose. Then, Demi happened. After she and Colton called her mom — who's now home from prison — on the group date, she was feeling extra confident. After he returned from his Kirpa date, she put on her best jean shorts and walked over to Colton's hotel room. She dropped the “I am falling in love with you” bomb but instead of Colton reciprocating her feelings, he decided to send her home. "There’s a part of me that just doesn’t know if we can get there. I don’t know right now if I can see myself with you at the end of this," he said. Demi was obviously heartbroken. "This is why I haven't wanted to be in a relationship for a really long time, because of this feeling," she said. "Nobody has ever loved me back." Katie was the one to go home, and on the way out, she warned Colton that some women are there for the wrong reasons, which he said was his worst fear. Will that fear wind up being true? We'll have to wait and find out... especially since it looks like Colton's fence jumping fiasco is happening next week!